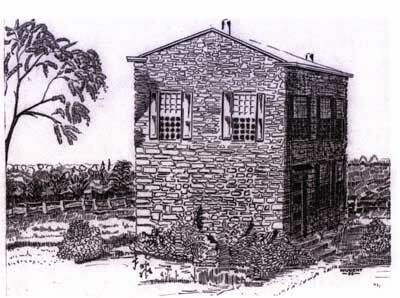 Abstract: Original Drawing by John Nugent after consultation with John Preston Stirk of what the first Merion Square (Gladwyne) school house looked like. Reportedly built before 1835 at 920 Youngsford Rd. where the present Montessory School is in 2004. This stone structure probably used from pre-1835 until c. 1884 when it was replaced by the existing school building.